Welcome to the Worst-Case Macro Scenario: Stagflation Cycle Begins? The January retail sales number is out, and what a number it is. Against expectations of a 0.3% increase, retail sales actually fell 0.2%, their biggest monthly decline in a year. Inflation rising. Sales falling. The worst macroeconomic combination: stagflation. 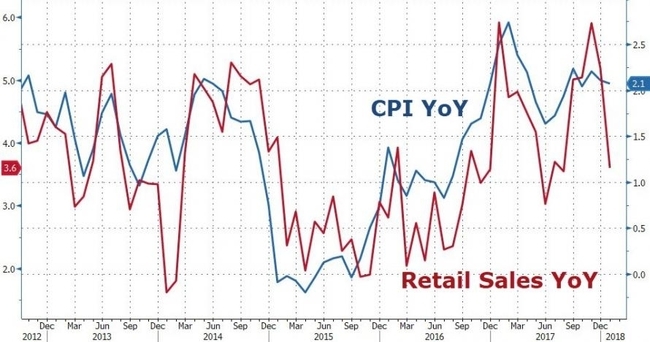 This sharp decline in retail sales takes place just as inflation is spiking, confirming that this could be the start of another dreaded stagflationary episode in which retail sales and CPI diverge to the point where they drag the economy into a recession. But the worst news: the US consumer is now tapped out, with personal savings just shy of all-time lows. 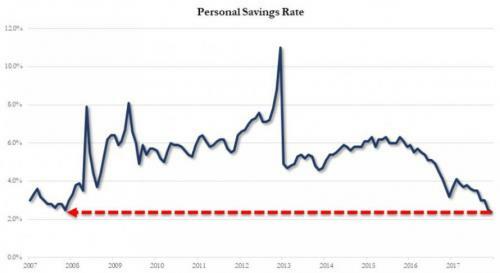 Which means any further increases in spending will be reliant entirely on rising credit card usage, which in a time of rising rates and surging APRs, is virtually certainly not to happen.